Polished Agate is an amazing mineral, it reveals shapes and patterns which appears like tiny scenes. I came across a green agate and found layers of deep water in the sedimentary layers. Shaped like a water-drop, it seemed appropriate to frame it with sterling waves and crown the amulet with a sculpture of a Sea Spirit. 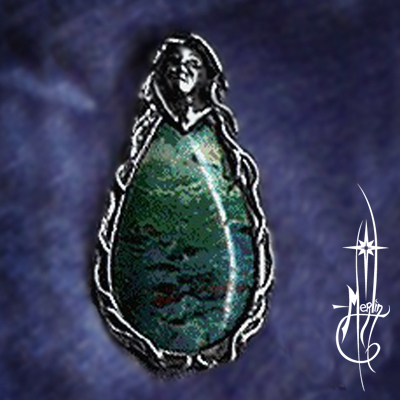 The Lady of Oceans Amulet is hung with a back bail, a kind of loop hidden behind the head of the spirit, making the piece appear to float on a chain or cord. This one of a kind amulet was purchased days after completion and resides in a private collection. If you would like a one of a kind amulet (or pendant) inspired by the images in your favorite stone, please visit my how to order custom page.